But despite this many people are often not taking the most basic of precautions online. Almost 50 per cent admit using the same password for all online accounts, with around 40 per cent using obvious personal information to form their password. Around 30 per cent of people using social media such as Facebook and Twitter have accepted a ‘friend’ they do not know in real life, while 47 per cent often do not log off of websites when they’ve finished using them. Use a PIN or password to secure your phone or tablet and online accounts such as banking, social media or online stores. Look for the secure padlock in the web address bar when you are logged in or registering for an online account, the web address should also begin https. Make sure your home WiFi is secure using a strong password. When using public hotspots do not access or use personal information on the internet. Always make sure you log out / off when you have finished using an online account. Never open or forward a suspicious looking email or reply to a social media message from a stranger. Use anti-virus software to protect your devices and make sure that it is regularly updated. New viruses are appearing all of the time. Think about what you are posting on the internet, once it has been written you may not be able to erase it. Make sure that you have the correct privacy settings for you social media accounts so that only the people you want to can share your posts. When purchasing online, particularly using online auction sites and classified ads do not transfer money directly from your bank account. Use a credit card where possible or payment processor such as Paypal. 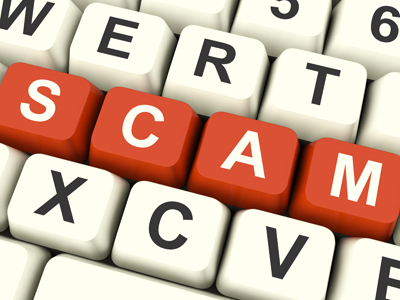 If you are a victim of online fraud, report it to http://www.actionfraud.police.uk/. This can help to make the internet more secure for everyone.